Humanity's unspeakable doom never looked so cute. StarCraft II: Heart of the Swarm burst out of its cocoon yesterday, and its intro cinematic continues a Blizzard tradition of setting the scene with gorgeous animations. 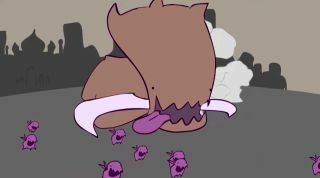 CarbotAnimations ' skillful hand-drawn replication of the intro's Zerg-on-Terran assault isn't as shiny, but if the derp-faced aliens and pudgy marines don't earn at least one giggle, then the Zergling vanquishing a soldier with a barrage of licks ought to. Now I'll feel bad whenever I blow up a Zerg base—all they wanted was cuddles. You can find the rest of CarbotAnimations' shorts on YouTube .